1 of 2 In a large, heavy-bottomed saucepan, heat together the olive oil and the shallot over medium heat for 1 minute. Add the eggplant; cook, uncovered, stirring occasionally to prevent the eggplant from sticking to the bottom of the saucepan, about 50 minutes or until smooth, thick and somewhat dry in texture. If mixture becomes too dry, add a little water, a tablespoon at a time. 2 of 2 Transfer the eggplant mixture to glass bowl. Stir in the salt, pepper, lemon juice and vinegar until well blended. Let the mixture cool. Cover the bowl tightly with plastic wrap; refrigerate until ready to serve, or up to 1 week. 1 of 2 While the eggplant is cooking, heat the oven to 350 degrees F. Cut the loaf of bread diagonally into 1/4-inch-thick slices, for a total of about 24 slices. Brush one side of each slice with the olive oil. Place the slices, oil side up, on a baking sheet. 2 of 2 Bake the bread slices in the 350 degrees F oven until golden and slightly crispy, about 10 minutes; turn the slices over halfway through the baking. Rub the hot crostini a few times on both sides with peeled garlic cloves. Let the crostini cool. Store in an airtight container until ready to serve, or up to 2 days. 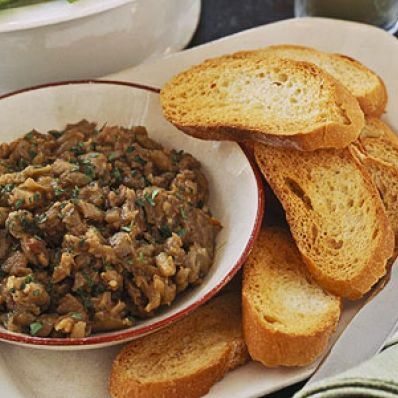 1 of 1 Spread 1 tablespoon eggplant caviar over each crostini. Serve immediately. Any leftover eggplant can be used as a dip for vegetables.